Epson's first monochrome integrated ink tank system printer, with WiFi connectivity, for ultra-low-cost office printing. 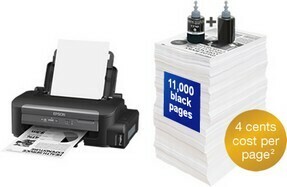 Each printer comes with two black ink bottles - one starter bottle and one standard 140ml bottle that offer a large combined page yield of 11,000¹ pages. Epson’s fast-drying genuine pigment ink ensures business documents are water and smudge resistant. The convenient 140ml ink bottle can print up to 6,000 pages¹ and delivers an ultra-low running cost of 4 cents per page, or just R20 per ream of paper (500 sheets)².